This shrine originated when a temporary palace was set up for the official royal visit to Arima Onsen of Emperor Jomei and Emperor Kotoku. It was first worshipped as their protector deity. Since it is Oinari-sama, there are foxes everywhere. They work hard as servants for Inarikami. 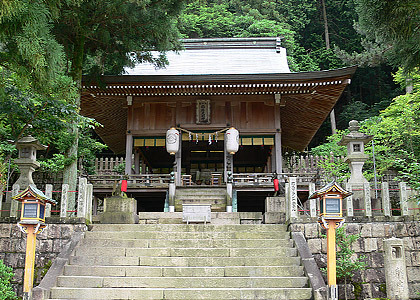 It is located on ten mountain side of Mt. Ibayama and the mountains of Tanba can be seen in the distance. The spectacular view is enough to make you forget about the long climb up to visit the shrine.